WATERLOO - Kim Ann Anderson, 57, of Waterloo, died Monday, April 23, 2012 at Cedar Valley Hospice Home. She was born Jan. 27, 1955, in Waterloo, daughter of Floyd and Joann Cox. She married Mark D. Anderson on Oct. 21, 1978, in Waterloo. 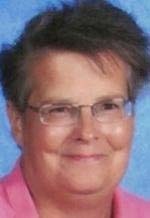 A 1973 graduate of Waterloo West High School, she worked as a food service employee for the Waterloo Community School District for many years. She attended Lighthouse Fellowship Church. Survived by her husband; two daughters, Shelly Anderson of Waterloo and Kristi (Jared) Robb of Rochester, Minn.; her parents of Waterloo; two brothers, Greg (Sally) and Brad (Miki) Cox, both of Waterloo; and her mother-in-law, Dorothy Anderson of Waterloo. Preceded in death by her paternal and maternal grandparents; and her father-in-law. Memorial services: 4 p.m. Sunday at Lighthouse Fellowship Church. Memorials may be directed to the Cedar Valley Hospice Home, 2001 Kimball Ave., Waterloo 50702. Kim had a deep love and passion for children and gardening.